The mission to spread legal online poker across America is moving at a snail’s pace. And of the three states that currently have iPoker – Delaware, New Jersey and Nevada – only New Jersey boasts a significant population (8.9 million). Even still, there’s excitement that a big state could soon throw their hat into the mix. As of now, many hope that California (38.8 million residents) will regulate iPoker next year. But if that doesn’t happen, perhaps New York could be the next to do so. 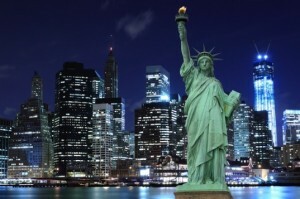 The Empire State has been in the discussions involving states that are interested in online poker. But the main hurdle to them taking iPoker seriously was deciding who would receive licenses for future upstate brick-and-mortar casinos. Well, the selection process is now over with, so poker will most definitely be on the agenda for 2015. Speculation is that New York doesn’t want their neighbor, New Jersey, siphoning poker money off their residents who cross the border to play. Furthermore, a study by MGM Resorts showed that New Yorkers spend $110 million per year playing at offshore poker sites. The study also concludes that the state could make between $50 million and $80 million in tax money by offering legal iPoker. Going back to MGM, they’ve been heavily lobbying the New York government to regulate online poker. And this is quite interesting when one considers that MGM doesn’t currently have an iGaming presence in the US. So it’s likely that they see the profitability in the Empire State and want to get in on the ground floor. Of course, the biggest boon for the industry will be when larger states form interstate pacts with each other. Sharing players and liquidity would allow for much larger games and tournaments, thus making the online poker market far more lucrative. Unfortunately, it seems like this is still several years away though.